Experiments on the performance of wide, post-tensioned band beams under seismic load have recently been undertaken at Swinburne University by PhD candidate Matthew Davey. Beam widths of around 2400mm are regularly used in Australian concrete floor systems, and are significantly wider than the supporting columns (commonly in excess of 4 times wider). These beams are required to be able to deform with a building during an earthquake and are increasingly being used as lateral resisting moment frames. However, relatively little is known about their performance under earthquake type loading. Thus far the experiments have shown good drift and ductility performance, with drifts of around 3% being achieved prior to any significant loss in capacity, which is suitable for low to moderate seismic zones. ATENA 3D is being used to model the test specimen. 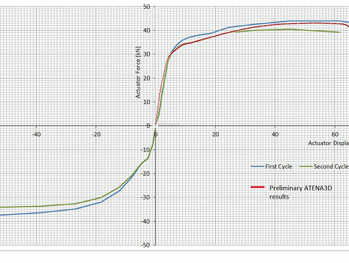 While analysis is still preliminary, model results are already showing a strong correlation to those achieved in the experiment. The testing was undertaken in the Smart Structures Laboratory at Swinburne University of Technology in Victoria, Australia. The $15 million laboratory is a major three-dimensional testing facility developed for large scale testing of civil, mechanical, aerospace and mining engineering components and systems and the only one of its type available in Australia. The 1.0m thick strong floor measures some 20m x 8m in plan with two 5m tall reaction strong walls meeting at one corner. 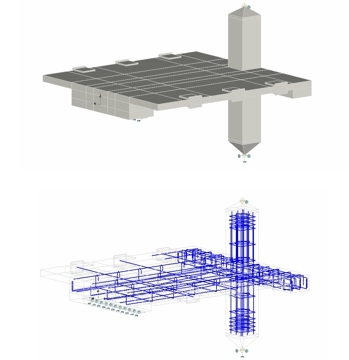 The 3D strong cell have a grid of tie down points 0.5m apart over the whole floor and walls to secure the test specimens, as well as a suite of hydraulic actuators and universal testing machines varying in capacity from 10 tonnes to 500 tonnes. Future acquisition includes a 2500 tonne testing machine. The laboratory contains the Hybrid Testing Facility (HTF) that allows for combined experimental and computer simulations interacting in real time to determine the response of structural systems. This is a very cost-effective technique in which the structure, including foundations and soil conditions, are modelled numerically while critical components of it that are likely to experience excessive nonlinear/inelastic behaviour are modelled experimentally. The interaction between the computer and physical simulations occur at the boundaries with high performance servo-hydraulic actuators and real-time feedback controllers. The versatile 6-DOF loading and boundary conditions system is capable of imposing complex multi-axial forces and displacements on full scale structures or sub-structures at multiple application points. The HTF can be effectively used in modelling, simulation and testing of structures subjected to extreme loading events generated by earthquakes, wind and ocean waves. Applications include structural safety of buildings, bridges, and offshore structures and development of efficient renewable energy systems.